Most Australians inside and outside of government don’t know about open government. They don’t understand what ‘open’ means. And importantly, why it’s a good thing, how they can get involved or what to do. Making Open is a channel dedicated to helping promote open government. A home for practical how-to stories, original and curated content from around the world, interviews with open government champions, and a platform to show what can be done. Launched during Open Gov Week 2019, our mission is to make sure open government is understood and adopted, and celebrate the inspiring work people are doing locally and globally . We also wanted to create a way to capture great ideas from people in our communities to share with our governments about how they can be more open. We are active contributors and supporters of open government. In 2018 we contributed over 400 pro bono hours to open government advocacy and work. We support the OGP Civil Society Network when we can, and create things like process pathways, write submissions, contribute ideas for commitments, and help support the Australian OGP Secretariat and other government commitment custodians by wrangling participants to consultations. Specific open government themes we advocate for are; open contracting, beneficial ownership, extractive industry transparency, open data, open process, and public participation in government decision making and service design. We do this work pro bono and it is all funded by us because we are committed to ensuring open gov is embedded and successful. Open Gov week in May 2018, we decided someone needed to celebrate and raise awareness for open government in Australia! So we took it upon our selves to; create a series of gifs for social, a poster explaining the commitments, organised a webinar, and hosted an open gov love gathering at our favourite local pub - bring 40 government and active citizens to meet and share ideas. 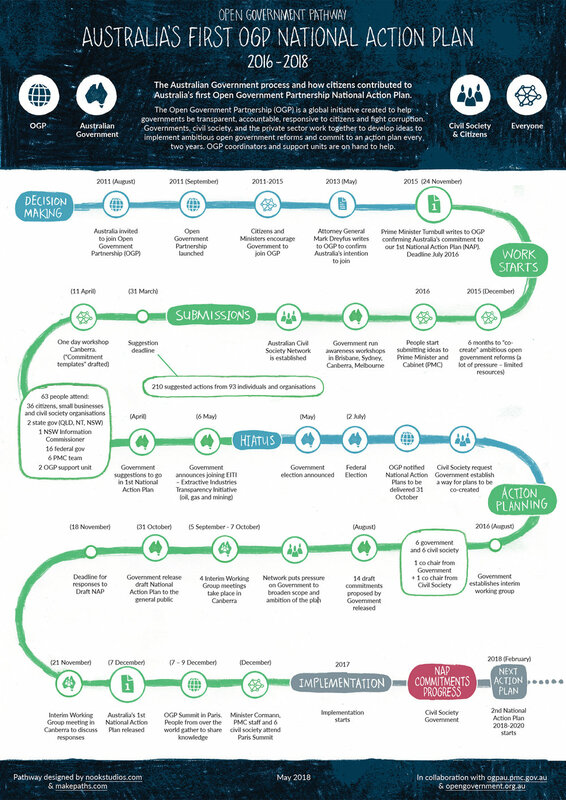 To help raise awareness for open government, we made a process pathway to tell the story of how the Australian Government, citizens, civil society, the private sector, and small businesses worked together to develop Australia's 1st National Action Plan, released 7 December 2016. It was widely used by civil society, the OGP Independent Reporting Mechanism, and the OGP Secretariat team for advocacy and as a useful explainer. The process pathway was updated to reflect the latest updates for Open Government Week in May of 2018. You can download the latest version here. The Open Government Partnership (OGP) was established in 2011 to provide a platform for governments to be more open, accountable, and responsive to citizens. There are now 70 participating countries, where Government and civil society work together to develop and implement ambitious open government reforms. Australia was invited to join the OGP in 2011 and wrote of its intention to join in 2013. In November, 2015 Prime Minister Malcolm Turnbull advised the OGP that Australia would commit to membership and develop Australia’s first National Action Plan to be submitted in July 2016. The Federal election meant a few delays happened along the way. The Australian Government submitted our 1st National Action Plan on 7 December 2016. We created an illustration to explain the process and where citizen participation happened here. Australia's Civil Society Network was established in December 2015 to work with the Government on developing plans. It now has over 50 members and they are actively looking for new members to ensure a diverse range of views are represented and voices are heard. We are a small private company working on open government initiatives because we are passionate about fairness, openness, transparency, participation and inclusion. The suggestions and contributions we have made to the commitments for the Open Government Partnership National Action Plan reflect what we have experienced, observed, and learnt through collaborating with government agencies. Some address core root issues hindering openness and innovation, others are opportunities (or potential solutions) we have identified the government could implement to improve participation and deliver its promise of ambitious open government initiatives, modernising the civil service, and being responsive to citizens. Mel participated in the initial workshop help in Canberra April 2016 and has continued to contribute suggestions and advocate for open government. She was able to attend and participate in the OGP Natural Resources Working Group workshop whilst in Madrid in October 2016 for the International Open Data Conference. In November 2017 Mel attended the Open Contracting Partnership Conference in Amsterdam, a gathering of 200 people from all over the world working in open contracting, anti-corruption, and procurement reform. The Open Contracting Partnership (OCP) are now helping support Mel and May Miller-Dawkin’s advocacy work and to develop ways to help introduce open contracting to Australia. In July 2018 Mel travelled to Tbilisi, Georgia for the OGP Summit, where she presented a lightening talk about Nook’s work with other open government reformers and she attended the 2018 International Open Data Conference in Buenos Aires, Argentina.